Twenty years ago, when I first began reading through my Bible in a purposeful way, with a commitment to myself to read through annually, I had no idea how significantly God would bless me through the pages of His Word. 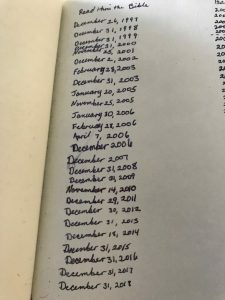 Yesterday, however, as I completed my annual journey and recorded the date in the back of my Bible, I looked at the previous dates already recorded there, and I began to reflect on some of the events that had taken place during those years. These weren’t all easy years. Some were full of joy and others full of challenge. Some were downright tumultuous. This entry was posted in Christian life and tagged Bible Reading on January 1, 2019 by Monica Bass.